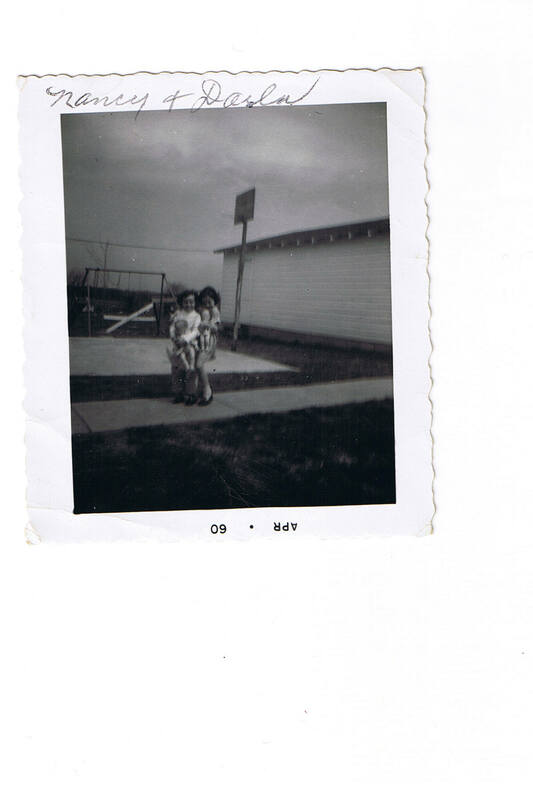 The neighborhood wouldn’t have been complete without the “little sisters.” That is, Terry’s little sister and my little sister. You never saw one without the other. You never saw either without their babies in one arm and their diaper bags thrown over the shoulder of the other arm. Nancy lived up the hill from us, a block away. Those two kept that road hot. I can still see them walking up or down that hill with their “children.” They would meet in the middle to discuss important “stuff” or just to walk with the other to one of the homes. As they grew up, they embraced Barbies (along with the babies) and went wild and crazy over the Beatles. One of them would get a pretend microphone and stand on the bed and pretend to be the Beatles, singing her heart out, “I Want To Hold Your Haa-aa–and,” while the other, standing at the foot of the bed, would squeal and scream and fall down on the floor… just as the girls on the TV did at the Beatles concerts. Nancy was Catholic; Darla was Southern Baptist. I’m not sure what kind of Catholic game they played, but I was privy to the Baptist one where Darla would stand and preach to Nancy and sing hymns. She perfected her preaching when she was raising her children and ordering them to get dressed, clean their rooms, just generally behave… and she still sings hymns. I’m thinking that Baptist preaching Darla taught Nancy may have come in handy as Nancy raised her own four children and had to do a little preaching herself. Loved it Brenda…I remember that well !!!!!!!! Makes me wish for those times again.Sorry I missed you Friday! The easy days, weren’t they? I was so disappointed I missed you too! I love this picture of Darla and Nancy. I love Grandma’s handwriting on the picture. And I remember Nancy so well! Jill, Darla, brings back good memories, that picture and handwriting. What a cute memory. I know exactly where that picture was taken!! Nancy was so protective of her Barbies. Terry and I were forbidden to touch them! So we would wait until Nancy went to bed and we’d play with them. One night Ken’s head broke off! We knew we were in big trouble now! hahaha Terry and I email every day and sometimes several times a day! We share everything! We’ve been friends since we were four. Guess it was the same for Nancy and Darla. Isn’t it neat to have lifetime friends?